What are your thoughts about the future of libraries? 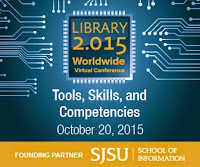 Join the global discussion during the Library 2.015 Worldwide Virtual Conference, a free online conference co-sponsored by the San Jose State University (SJSU) School of Information. The fifth annual conference will take place on October 20, 2015 from 7 a.m. to 8 p.m. PDT, and presentation proposals are now being welcomed on a variety of topics addressing the ever-changing field of 21st century information. The completely online conference offers an excellent opportunity for graduate students, doctoral candidates, scholars, and information professionals worldwide to network and present cutting-edge ideas and research on contemporary practices and emerging trends in the information profession. Proposals can be submitted now through October 1, 2015. Presentations should be at least 20 minutes long, and sessions must be completed within one hour. Free training on Blackboard Collaborate will be available for all presenters. Proposals will be reviewed in the order in which they were received, and a total of 50 proposals will be chosen for the day-long conference. Complete information on how to submit a proposal is available on the Library 2.0 website. The Library 2.015 Worldwide Virtual Conference is free to attend thanks to the support of partners, sponsors, advisory board members, presenters, and volunteers. Get involved and reap the benefits of the global pool of information. Get the latest conference news and updates at library20.com/2015. The Library 2.0 virtual conference series was co-founded by Dr. Sandra Hirsh, director of the SJSU School of Information, and Steve Hargadon of The Learning Revolution, in 2011. The San Jose State University (SJSU) School of Information prepares individuals for careers as information professionals. Graduates work in diverse areas of the information profession, such as user experience design, digital asset management, information architecture, electronic records management, information governance, digital preservation, and librarianship. The SJSU School of Information is a recognized leader in online education and received the Online Learning Consortium's Outstanding Online Program award. For more information about the school, please visit:http://ischool.sjsu.edu.